Many exciting events are happening at Haiti Missions! Explore our website to learn more about the projects that are currently underway! Thanks for visiting and please check back for more updates! Want to see what Haiti Missions has been up to over the past years? Check out this quick video! Like the video and want to know more? Feel free to scroll down to learn more! We served: 504 - medical patients, and 100 - dental patients! 16 new souls were added to the Kingdom of Heaven. Thank you to everyone that attended and/or supported the Haiti Missions Fundraiser Banquet. you MADE IT A GREAT SUCCESS. OUR NEXT HAITI MISSIONS BANQUET IS TENTATIVELY SCHEDULE FOR FALL 2019. Medical, dental and spiritual hope to the people of Haiti. BECOME A MONTHLY SUPPORTER OF THIS MINISTRY BY DONATING ON-LINE. Cite Soleil Church has been a focus of our mission's efforts since our first visit there in 2008. In 2013 we felt God leading us to help them build a better church building. So, with much prayer and our financial commitments, the process began. We contracted a US company to fabricate the metal beams and other roofing structure that was shipped to Haiti in Spring of 2014. Tim & Karen spent one month in Haiti to oversee the project. They continued to take teams in through out the year to continue working on the building process. On March 28, 2015 the team arrived and were very excited to see what the Lord would do throughout the week. Our 20 member team was able to meet many medical and dental needs of the Haitian people. Our evangelism team had been in preparation for the trip for many months and was ready to go and spread the Good News! We also worked to install electrical wiring, lighting and ceiling fans inside the structure. On Good Friday our spring team was able to take part in the dedication service of the newly constructed church at Cité Soleil! Our construction team also worked hard to assemble 20 new church benches. We had approx. 300 people in attendance for the dedication celebration event. Everyone in attendance were treated to a nice meal, sponsored by our mission team. 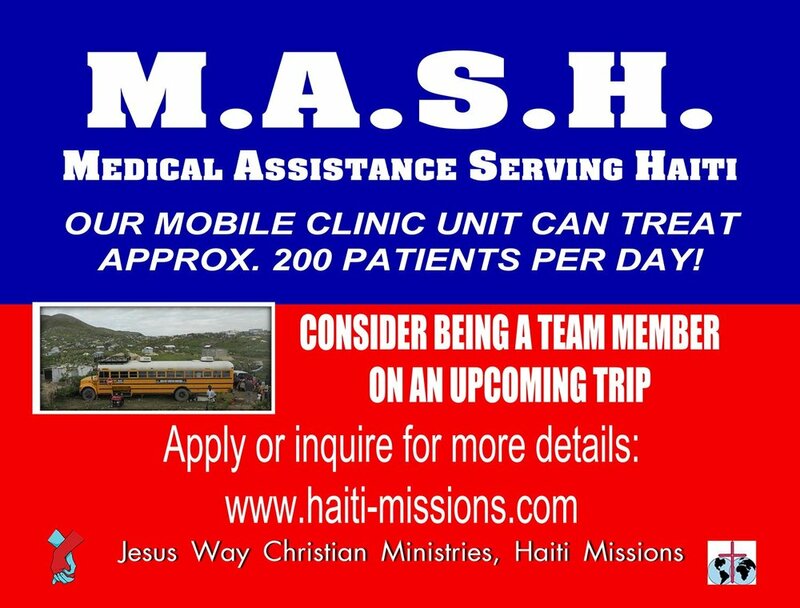 The Haiti Missions mobile medical/dental clinic bus is one of the largest endeavors we have undertaking to date. The process of converting a 38 foot school bus into a clinic was exciting to say the least! Lots of hard work and over 40 plus people were involved. Everyone worked together and used their God-given talents to make this dream a reality! In March of 2012, the completed mobile clinic reached Haiti and has hosted many clinics since. Praise the Lord! Entering the mobile clinic, you will see the medical exam room and seating for patients while waiting. From the rear entrance of the bus, you will be greeted by the dental portion of the mobile clinic, which contains two dental chairs. Our pharmacy and sterilization area resides at the center of the clinic. An astounding 95% of everything used in the conversion of the bus was donated! Our Medical/Dental Mobile Clinic is certainly one of our largest ministry tool! 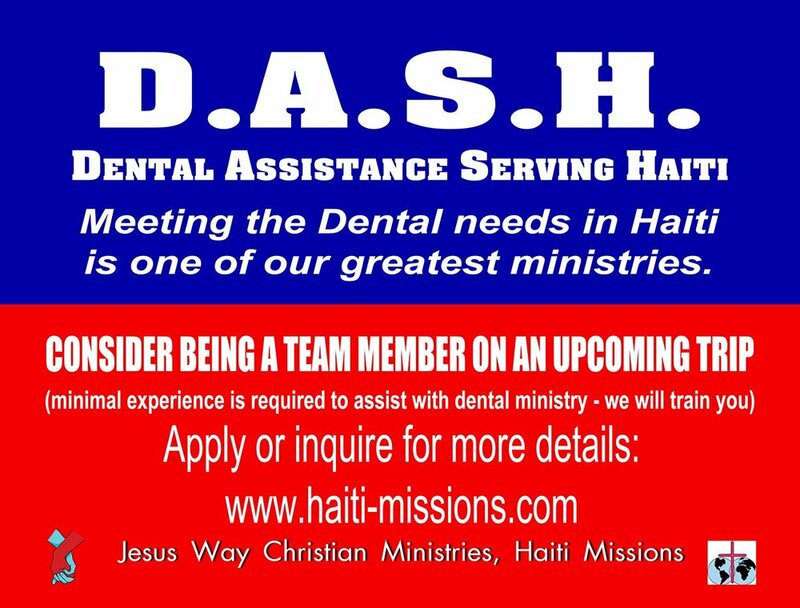 Consider to join one of our upcoming medical or dental clinic teams.